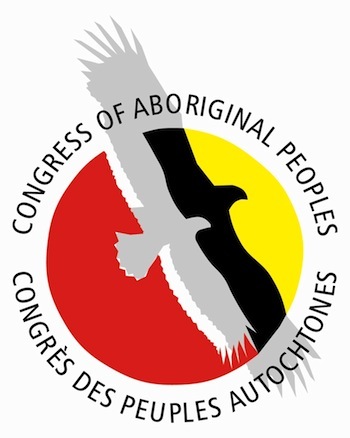 Ten years after the conversation began, the Congress of Aboriginal Peoples has an affiliate organization in Alberta. The Aboriginal Congress of Alberta Association, headquartered in Edmonton, received unanimous approval at CAP’s annual general assembly in September. Beverly Allard, president of ACAA, has been involved since the beginning. In 2006, she had conversations with then-CAP National Chief Patrick Brazeau, who undertook a western tour of the grassroots. This past January, she had discussions with then-CAP National Chief Dwight Dorey, who was on a cross-country tour. In between, she says, when an application was made to become a CAP affiliate in 2010, ACAA was turned down because it did not have an audited financial statement. Allard says up to that point, she was covering all costs for outreach and town hall meetings as there was no core funding. Allard says the affiliate is still very much needed. “Having a representative body within Alberta that can kind of act as a political voice for those folks that currently have no other alignment with a political representative body -- the Metis Nation Council for instance, Assembly of First Nations, for instance -- those folks we really feel need to have an equal forum and equal support in bringing forward a collective voice and being able to have an opportunity to speak to those issues that aren’t otherwise articulated by those in position of influence,” said Allard. CAP, recently renamed from the short-lived Indigenous Peoples Assembly of Canada, has as its mandate to represent the interests of all off-reserve status and non-status Indians, Métis and southern Inuit. Without affiliation with a band or the Metis Nation, health care and education funding are difficult to get, says Allard, and that’s where CAP comes in. ACAA has board members throughout the province. Robert Bertrand, who was elected National Chief at the AGA, is pleased to have recently added affiliates from Alberta and British Columbia. “Now we’re truly national,” said Bertrand, who added that this new status will help CAP in attaining the same level of influence as the MNC, AFN and Inuit Tapiriit Kanatami. “CAP as a national body really missed for a number of years having the support from the western provinces,” agreed Allard. She sees the Daniels decision as an opportunity for CAP to have a stronger voice nation-wide. “Although those folks (AFN, MNC and ITK) do a great job, there’s still folks that aren’t equitably represented so I think we just need to be a little bit louder,” she said. AACA is presently developing its strategic plan and Allard will be attempting to access funding through CAP to allow the local affiliate to hold town hall meetings in both the southern and northern parts of the province. “As a body, one of our primary goals is really to bring forward a political voice within the national office that can represent people from Alberta to the Alberta government, to the federal government. And bringing our voice to a table where collectively others are coming, it gives strength,” said Allard.